Last Sunday R.'s mom was in town for Soergel's Strawberry Festival. After an afternoon of strawberry picking, we were ready for dinner! We decided to head up to Flavor of India by Tamarind in Cranberry. I had heard good things from those who have been to their Oakland location, so I went in with pretty high hopes. Flavor of India by Tamarind is located on Route 19 in one of the smaller strip malls on the east side. The atmosphere is casual and the menu pretty standard for Indian fare. 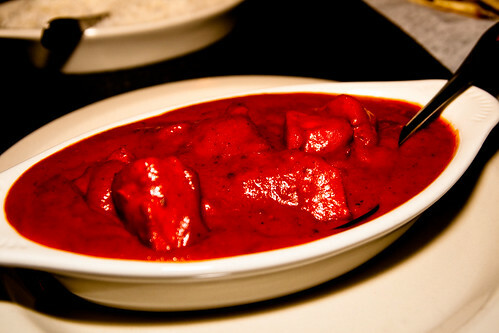 I ordered the Butter Chicken in a creamy tomato sauce which was absolutely fantastic with a great tomato flavor. In fact, after having the Butter Chicken here, I was inspired to make my own at home with a five-star recipe from Food Network, but it wasn't nearly as good as the version by Flavor of India by Tamarind. I definitely recommend this one. We also had fabulous service. R.'s mom had wanted an item on the menu called Kadai Paneer/Okra, not realizing that it came with either paneer or okra. (In her defense, this wasn't clearly stated on the menu.) After some kind of miscommunication, they came out with the paneer version of the dish for her, which was not at all what she wanted, not being big on cheese and all. When we explained to the manager that we wanted the okra, he immediately put in the new order and let us have the paneer dish on the house. (I had a few bites of the leftovers the following day and it was great! The paneer is delicious!) We felt awful about the mix-up, but I came away being quite impressed with how they handled it all. That calls for some brownie points, and a repeat visit in the future. Update 12/24/2011: New blog post on our second visit here.